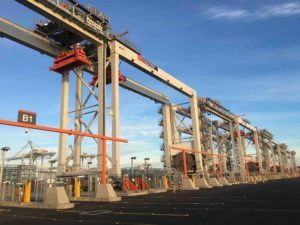 Kalmar and Navis, both companies are part of the Finnish Cargotec Corp., have announced today the delivery of the first OneTerminal automation solution to ICTSI’s Victoria International Container Terminal (VICT) at the Port of Melbourne, Australia. Kalmar OneTerminal provides an integrated automation solution, delivered by one team, bringing together Kalmar and Navis software systems, equipment and services for a seamless deployment. Kalmar’s OneTerminal deployment at VICT includes the Kalmar Automatic Stacking Crane (ASC) system with 20 ASCs, 11 Kalmar AutoShuttles, Kalmar Automated Truck Handling (ATH), Kalmar Terminal Logistics System (TLS) and the Navis N4 Terminal System. Additionally, Kalmar provided a range of project services required to deploy and support the solution. Kalmar signed the contract with VICT in August 2014 and since then both Kalmar and Navis teams worked hard, which allowed to complete the project on budget and ahead of schedule. The software solution combining Kalmar TLS and Navis N4 Terminal System was pre-integrated and tested before the delivery, speeding up the deployment, according to Tero Kokko, Senior VP, Kalmar Automation and Projects. The deployment has made VICT the world’s first fully automated international container handling facility. As we wrote earlier, VICT is Melbourne’s newest container terminal launched by ICTSI last December. It is located north of Port Phillip Bay at the mouth of the Yarra River in the Port of Melbourne’s Webb Dock East. Currently ICTSI is developing Phase 2 of the facility which, upon completion by the end of 2017, will see an annual capacity of 1 mln TEU. At full development, the 35.4 hectares terminal will have 6 Post-Panamax STS cranes at 2 berths of 660m length and a capacity of 1.4 mln TEU.